Welcome to our chaplaincy website! 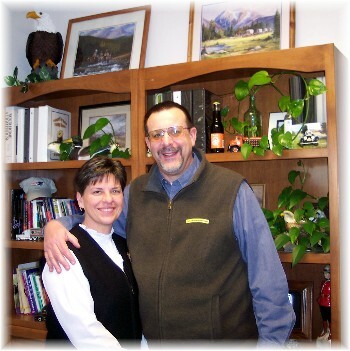 We are Stephen and Brooksyne Weber, chaplains at several companies throughout southcentral Pennsylvania. Perhaps you have met us when we have visited your company or you may be a company owner, manager or human resource person who has heard about us. This site will tell you more about who we are and what we do! We seek to operate with integrity and seek to build trust in all we do. We will safeguard information we have obtained through chaplain care relationships. We will show sensitivity regarding the moral, cultural, social, and religious standards of people with whom we have a chaplaincy care relationship. We will avoid imposing our beliefs on others; although we will certainly express them when invited to do so. We will care for all employees regardless of race, creed, color, marital status or religious preference. Our work is non-denominational and non-sectarian. We will strive to serve and care for all with whom we come into contact. We view all forms of sexual behavior and/or harassment of our clients as unethical and inappropriate. We will strive to honor God; to be honorable people; and to be respectful of each other, our clients, and other stakeholders. *Local, state and federal laws require full disclosure in cases of child abuse or where personal safety is at risk. Sign up to receive our free daily encouragement email message.